The cliff collapsed into the Atlantic Ocean on April 8, 2007. The road was closed, but a new temporary road was open by April 13. More about this is at http://www.dinglename.com/articles/article.asp?a=144. According to http://www.dingle-peninsula.ie/active.html the collapse forced some herons to leave their country home and move to Dingle Town. had the story, but now the link is broken. After the dramatic collapse of the cliff and roadway at Cuas na gColúr beside the Dún Chaoin graveyard, fears mounted that the route would remain closed for the remainder of the year. 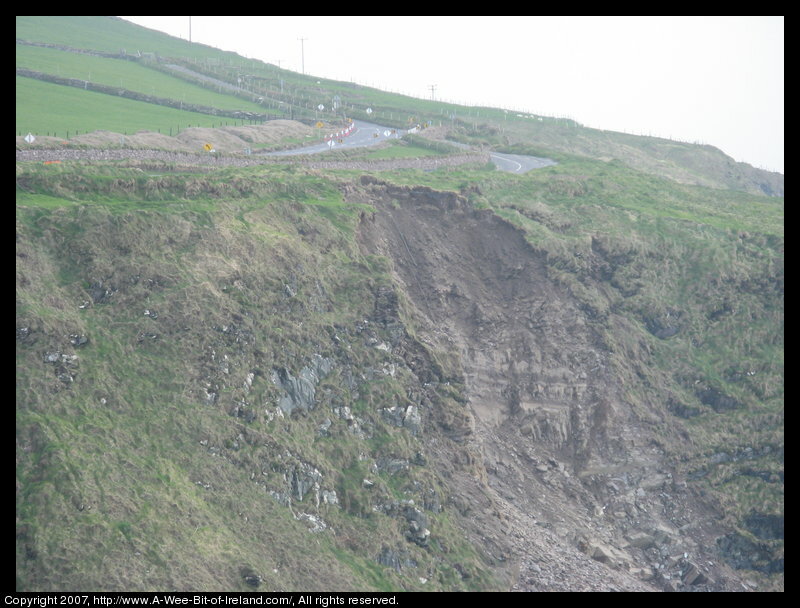 The dramatic landslide was witnessed by ferry operator, Mick Sheeran, who was skippering the Blasket Princess home when he heard what he described as a loud noise and he saw the cliff collapse into the sea. Major cracks then appeared in a 10-meter stretch of the roadway. Hundreds of tonnes of earth and rock suddenly crashed into the sea right alongside the road at Cuas na gColúr (the cove of the doves) between Coumeenole Bay and Dún Chaoin shortly after 7pm on Easter Sunday. The collapse was witnessed from out at sea by a local ferry operator. At the time two people were on the Atlantic cliff top, believed to be taking photographs and stepped back when a crack appeared beneath their feet. It is understood others were on the road alongside at the time when cracks appeared. Major cracks now line a ten-metre stretch of roadway at the spot and diversions are in place. The site is adjacent to the Dún Chaoin graveyard, where Blasket writer Peig Sayers is buried. The 48km Slea Head tour is one of the most dramatic in western Europe and attracts thousands of visitors. It passes by some of the richest archaeology on this island, including Bronze Age forts and early Christian beehive huts. Ceann Sibéal (Sybil Head), the Great Blasket Island and the Blasket Island interpretative centre all line the route. Some 40 years ago locals say the cliff and road also collapsed in the area. Locals believe the extremely wet winter weather followed by the equally dry period recently accelerated the collapse of the cliff.